With Solve’s mobile application everything your team knows about a client or project is literally a touch away. The entire history; what’s happening now, what’s planned next, statement of account, team emails and more can be at your fingertips. You’re at-the-ready to answer any question, pursue any idea or opportunity, and update the team - even while waiting for a morning coffee, or picking the kids up from school. Haven’t we dreamed of a solution like this? Fast forward to today, your business uses a service with no moving parts (no servers, software, IT guy, or excuses); it just works. You essentially carry around a piece of glass that runs forever and does almost everything. Sounds like a scene from Star Trek. Stand up and do a dance or stick your head out a window and shout! This is stuff worth getting excited about! If you’re not convinced, Louis C.K. has some funny examples for you to consider (worth the jump). Then take a moment to recognize we certainly live and work in exciting times. We’ve released a major update to the mobile application(s)! Also, quite recently we added the ability to login to the mobile application using your Google account too! You’re en-route to a meeting a client and you get a text informing you that the client record has been updated with new information pertinent to the meeting; you access the mobile app and find the newly uploaded document and comments to get you up to date. You have agents/personnel out in the field that need to coordinate with each other on a job. An agent marks their task as complete and another agent receives a notification of this and can now get to the next task for that project assigned to them. A few weeks ago your co-worker simply added a label to a Gmail message in their own account; today another co-worker did the same. 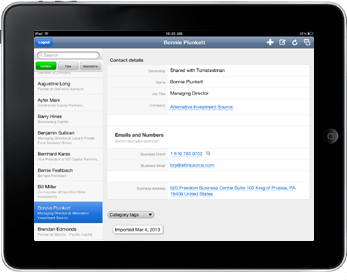 You pull up the contact on your iPad and along with the normal contact data you also see those two important messages linked. But they’re not in Solve!?! …. Or are they? It doesn’t matter, the data is organized, secure and there when you need it. Another example, a client just paid a Freshbooks or Xero invoice … repeat. This update replaces the older mobile app and provides a better experience on mobile devices with increased speed and an adaptive User Interface that scales with screen sizes. What this release also means is that we can now develop new iterations faster. We welcome your ideas on how we can continue to make the mobile applications even more useful to you and your team. To use the free mobile app simply point your device’s browser to https://secure.solve360.com/touch/ > add to your Home screen.